Last week Statistics NZ released their provisional population estimates as of 30 June 2015 and there were some interesting results. 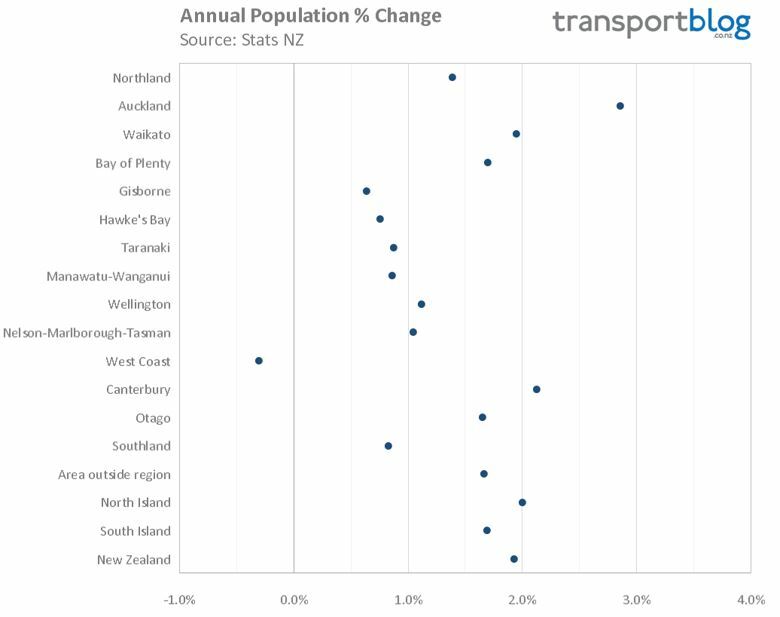 All regions in NZ with the exception of the West Coast saw their population increase with the largest increase both in total number and in percentage occurring in Auckland. In total Auckland’s population grew by 2.9% or 43,600 people. That’s not the largest percentage increase Auckland has seen but in terms of the number of people, it the largest increase the region has experienced since 1996 and probably the largest ever. In total growth in Auckland accounted for at least half of all growth in New Zealand (1.9% or 87,000 people) with the next fastest growing regions being Canterbury with 2.1% and Waikato with 1.9% with Bay of Plenty and Otago at 1.7%. The chart below shows the percentage growth in each region and as you can see Auckland is clearly an outlier compared to other regions. The regional growth doesn’t mean there isn’t some strong localised growth occurring. Stats NZ point out that at a Territorial Authority level there are a few areas growing faster than Auckland, they are Selwyn up 6.5%, Queenstown-Lakes up 4.9%, Waimakariri up 3.6%. None of those can hold a candle to the Waitemata local board though, more on that soon. Having both the largest population and it’s also being the growing the fastest region means Auckland now contains more than 34% of all of New Zealand’s population, that’s up from around 30% in 1996. 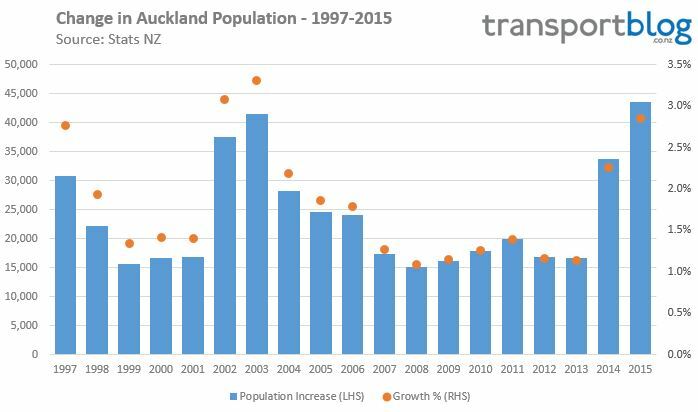 Below is the change in Auckland’s population since then. Within that growth Stats NZ say that migration has played a big role in recent years. Of the extra 43,600 people in Auckland they say 14,500 came from natural increase while 29,100 were from people migrating either domestically or internationally. By comparison last year had 14,200 from natural increase with 19,600 from migration. 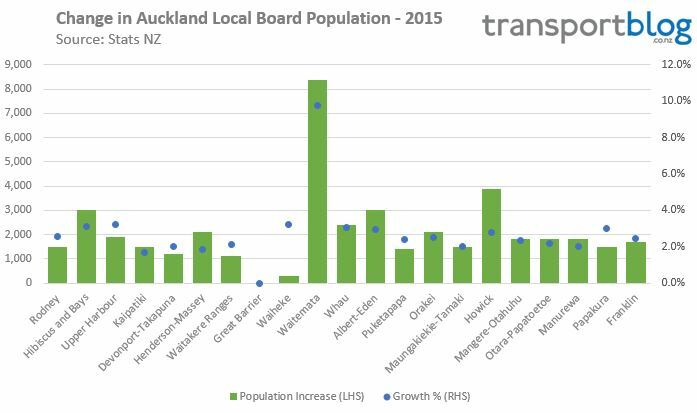 While Auckland is definitely growing strongly that growth isn’t occurring evenly with some notable differences at a local board level. The stand out in this area is the Waitemata Local board which grew a whopping 9.7% or 8,400 people in a year after growing by 6% the year before. Other than Waitemata the other local board areas to see a high level of new residents includes Howick, Hibiscus and Bays and Albert Eden. 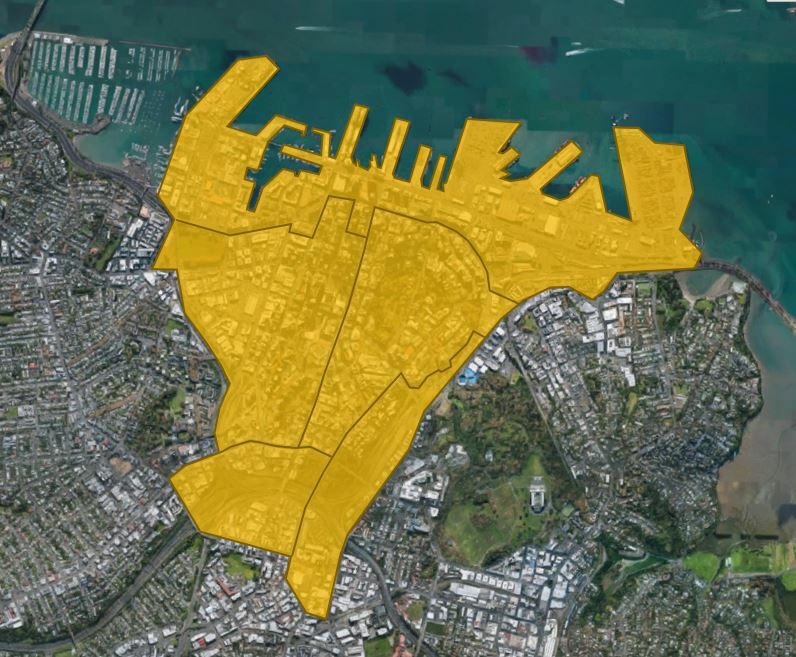 It’s amazing just how much the Waitemata Local Board area was able to grow in one year but where did all of those people go? Looking further we can find that more than half of it (5,460 out of 8,400) went to the CBD area – as defined by the Ministry of Transport for their CRL Targets – which is shown below. In fact combined the two area units in the middle – Auckland Central East and West – had a larger increase in population than any of the local boards (4,100 combined). The best suggestion I’ve heard for such a strong increase is the result of a large number of overseas students after a number of years of lower numbers coming here. Considering that over the last year there hasn’t been a huge number of apartments completed it perhaps suggests there has probably been a number of empty apartments tenanted and an increase in the occupancy of some apartments. 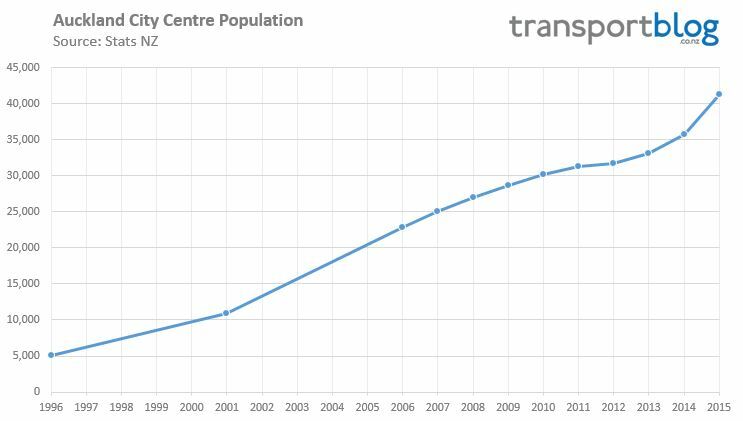 The increase saw the city centre population reach over 41,000 people, over 8 times what it was just under 20 years ago. The impact of all of these extra people has been enormous in making the city centre more vibrant and liveable, I’d suggest there’s a positive feedback loop at play. We are witnessing Auckland turning into a city. Again. It is at last recovering from the hollowing-out of the sprawl era. Auckland is undergoing a profound morphological change before our eyes; but one which is less violent and destructive than the last one; as that last big move, out to the suburbs, is not being eviscerated by the return of the city, but rather is being complemented by it. It’s not either/or; it’s and. So this transformation is in fact a sort of return, but a return at a much bigger scale, Auckland in the early 1950s was compact, well connected, but small. Decisions made around then to go for all out spread, to unpick the urban infrastructure of the tram network and replace it with the dispersive motorway network led to a curious centre-less place, un-urban in form; a sort-of city with a hole in the middle. No there, there. This is what is being fixed, and for everyone’s benefit. Doughnuts make for lousy inefficient conurbations; for all citizens including suburbanites. After all for suburbia to properly function it needs an urbs to be sub to. That is a great sign of Auckland’s growing sophistication; we have better things to do in the city now, frankly, than obsess disproportionately over bally-chasey. Oh that is absolutely ridiculous. I love rugby, and I also read Homer (admittedly not in the original Greek), Fowler on grammar, and Dostoevsky. Rugby is just as sophisticated, if not more, than the hipster-wet-dream-sophistication you aspire to. Sipping espresso on public land to enrich private cafe owners is not sophistication. Absolutely agree: espresso’s shouldn’t be sipped. Wait for it to cool slightly while grooming your mustache hairs and then knock it back before remounting your fixie. Personally I find Proust loses a lot if you dont read it in the original French. To be fair, the REAL test of Auckland becoming a real city is to be able to support a professional football (soccer) team. That’s the SOPHISTICATED kind of bally-chasy. Speaking of which, why have so many Old Right nostalgics started infesting this comments boxes, waxing lyrical about the glories of auto-driven sprawl? It’s almost as if there were an army of paid or volunteer trolls directed by some political force. Football (soccer) is a gentlemanly game played by a bunch of prima donna thugs (at least overseas it is). Would be nice to have an Auckland team in the A-League but considering Wellington is not wanted by the A-League that would not be likely. Sure is bizarre that we’ve ended up in a country where soccer is the posh game and rugby the game for the everyman. Not that I’m complaining. Not to be a snob myself, but soccer is an incredibly boring game, with precious little strategy beyond moment-to-moment tactics. Hope that wasn’t directed at me, because I’m to the left of Stalin. Not sure how sport was bought into your comment, i thought your comment was great. Im excited about Auckland’s transformation too, counting cranes on my way to work is a regular now, they keep popping up all over the place. To be fair, Auckland does have the country’s only professional teams in two other sports, basketball and rugby league. One of which has been doing pretty well. We have multiple professional sailing teams based here as well. It’s more the language schools, IT, all the other tertiary stuff. There are stats on this, I’ll try to dig them out for a post sometime. And what would you know about it?!? The PTEs you so pathetically disparage contribute an enormous amount, financially and culturally, to the life of Auckland – far more so, in dollar terms per head and per day, than international students at universities and other funded institutions, and than general tourists/visitors. But just carry on commenting in prejudice and ignorance, it all helps to build a picture of you! Remember what happened with all the dodgy English language schools in the early 00s? Remember all the dodgy financial deals involving modern-day PTEs like Taratahi? PTEs contribute nothing to NZ, or to their students. They simply make a few people richer. I love those language schools! They have helped save the heart of Auckland. The fact that I have my choice of Banh Mi vendors at lunchtime, or can sing karaoke at 2am on a Tuesday is awesome. Much better than they days of lunchbar tea rooms closing at 4:30pm and the city being a dodgy empty wasteland after dark (of course we still have the lunchbars too if that is your thing). Proof more than ever for the CRL to be started and finished as soon as possible. And for the Government to get in and finance it NOW ! Well I just purchased an apartment that is city fringe! #1: Hobson Street may be a traffic sewer, but it’s still more pleasant and definitely less dead than 90% of the streets on the North Shore. #2: It will keep booming for a while. Just from where I live I can see the Fiore II and the Sugartree being built. #3: Someone should go tell Auckland Transport. The traffic lights still assume only cars need to get through, and limit pedestrian green phases to the absolute minimum to make getting around theoretically possible. I’ve asked them a while ago if that missing pedestrian leg at the Police station is going to be fixed any time soon, but no reply. The rapid growth in the CBD is partly a reflection of how restrictive planning rules are everywhere else. The CBD is growing so fast because it is the only place where people’s desire to live centrally can be expressed. I imagine that there would be a lot more growth across the Isthmus and lower North Shore if zoning did not prohibit this. Agree. If transport and amenties were better in other areas and building density restrictions relaxed then we would see a lot more medium/high density townhouses/condos/apartments. Glad that the CBD is booming though. I have always thought it is such a shame that the CBD doesn’t have a population of 100,000 but at the current rate that won’t be too far away (possibly by 2030). As you mention it would be great to see apartments etc in Devonport for example (tastefully done to not ruin the heritage of the place of course). Completely agree. Those people wanting an apartment at Takapuna have to choose between an apartment in town or a multi million dollar house. eventually the cbd will be vibrant and shops will open late and with more food choice. One thing though, is the need of family friendy apartments that are suitable to bring up kids. Also easier access public to schools from cdb is needed. Finally the bus is quite complex in cbd with all the routes, it should be simpified, ie victoria bus all go to this direction, wellisley bus all go to other direction, and make it consistent. Inner link in queen st should have more frequency, with a bus lane, and traffic signal optimised. Sometimes it is faster to walk then use link on queen st. I see a lot of kids walking to (I assume) Freemans Bay school in the morning. A good place to live with kids would be in the apartments around Myers park. I see a lot of kids catching the NEX to Westlake/Rosmini/Carmel, and the ferry to TGS as well. We need to reform the local streets to make it safe for children to walk though. Yes I cannot possibly think of a reason why families would not want to live next to Myers Park. Certainly the new apartment buildings being built should help alleviate any problem there. I have to wonder if the new cbd buildings don’t account for the greatest proportion of new dwellings in Auckland? There are certainly new apartment buildings in the Waitemata LB area, which shows the most accelerated growth, and more to come; four new blocks on Hopetoun/Howe alone. #80 apts, maybe 1000 new residents. Really interesting blog. How come I didn’t see that in the Herald?